Above is Danny with his best pollack of the trip at 8lb 7oz, taken on a 10g jig head and a 4 inch grub. They had over 500 pollack between two of them, with around 300 between 4-6lbs !!! 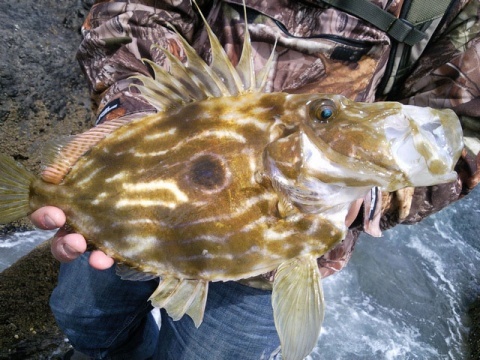 I love my bass fishing, but light tackle shore pollack fishing is just outstanding stuff. I have always loved the wonderful and complete lack of subtlety to a pollack - smash, grab, crash dive, hold on for dear life. Check out a lengthy and detailed report over on Danny's blog right here. Just look at the condition of these fish - shore pollack are so different to the offshore ones. I know they are obviously the same species, but the colouration on the shore ones is usually so much more intense. It has always struck me that most of Ireland's coastline is crawling with pollack, yet so few anglers seem to go for them. Just like over in the Isles of Scilly. OK, so banging loads of say huss and thornies out of somewhere like the Shannon is a blast, but rock fishing for proper running fish like pollack takes a lot of beating in my opinion. Bass might well be on my brain, but I have promised myself to get back to the west coast of Ireland next year and go smash a load myself again. It's been too long. Danny even managed to get over to the stunning and remote Dursey Island where we filmed a bit of one of my programmes a few years back. What a place. I bet it's still hardly ever fished.............dodgy cablecar and all !! If you are thinking of heading off to an area like the Beara peninsular (and I can't tell you enough how awesome and jaw-droppingly stunning this part of Ireland is), then I would strongly advise you to contact Paul and Anne Harris at their B&B here. Paul used to work for Tourism Ireland on the sport fishing side of things, and he is a complete fishing junkie himself - I have stayed with them before and it is a fantastic place, plus Paul is always more than keen to help out with masses and masses of local fishing info and knowledge. That kind of inside info is what can make or break trips like these. Have a look at Paul's fishing info page here. I have a photo essay on my website from my first ever trip to the Beara - see here. Danny even caught a John Dory on a lure, something I have never seen before. Sounds like one hell of a trip over there, and it just makes me feel so good to be able to sing the praises of some fairly "local" European shore fishing that can stand against anything else in the world. I was also really interested to hear that Danny was testing out one of these new Sakura Alpax spinning reels on the pollack (see here) and he tells me that the reel has come through with flying colours. Seems like a decent bit of kit to me for very sensible money. It seems that Ireland as a whole is really kicking off on the fishing front - we had a good trip over there the other day, and recent indications are that the bass are on fine form. I have even heard an unconfirmed rumour that Cian over at the new Absolute Fishing has some "under counter" MegaBass lures that he is not telling us about. Swine !! But then he knows how weak some of us are.......not me of course, I am mentally as tough as they come when shiny bass lures are concerned. A mate had one of 8lb off the top on a Patchinko recently (there seems to be something about this particular colour here, more and more anglers swear it does the business big time). I had some fish on this exact lure, plus the only IMA Popkey I actually have and smashed fish on over there has a yellow head and a clear body. Is there something about some shade of yellow on a surface lure, or is it mere coincidence ?